While Mark's chicken learning curve involved coops, the top of my list was food --- not food for the chickens, but food for us. We started out with twenty hens, then quickly scaled back to half a dozen because we didn't know what to do with so many eggs. Since then, I've learned the value of pastured eggs, meat, and broth, and our consumption has increased dramatically. Even after making that mental leap, though, we've had to learn how to cook with pastured chicken meat and how to incorporate more eggs into our meals. The latter is the easy part since a fried egg is a quick way to add protein and round out a lunch when leftovers don't quite stretch to feed us both. Combining occasional eggy lunches and dinners with our three eggs apiece for breakfast, Mark and I probably go through nearly five dozen eggs per week nowadays. I'm still working on the best ways to cook meat from our heirloom, pastured chickens since the flesh tends to be stronger tasting and a bit tougher textured than meat from Cornish Cross, even if they were raised on pasture. (The more-mainstream Cornish Cross don't forage as well as our chickens, so I assume their meat is less nutritious, which is one of the reasons we've avoided the breed.) 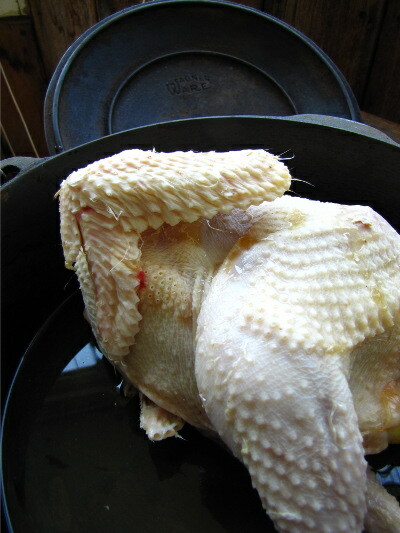 You can read some of my heirloom-chicken cooking experiments here --- most have been delicious. Even though I'm a bit afraid to open up the nutritional debate here, I'm still curious to hear from our readers. Have your tastes and beliefs about pastured animal products changed as you brought chickens to your homesteads and plates? The EZ Miser makes it easy to raise healthy chickens that produce healthful eggs and meat. Win a free chicken waterer! We love those dark yolks from our chickens. Ours are cooped, which saves our garden from chicken destruction and saves the poop all in one place for garden fertilizer. Right now our chicken numbers are down to 5 hens [4 of which lay]. They produce plenty of poop in the coop. We also have Saxony ducks which have been terrific layers and can free range without destroying the gardens. We keep them in the coop overnight to protect from predators, collect a bit of poop and so they'll lay where we can find the eggs. At any rate, all those eggs are Real Food and we eat them in whatever quantity we like [as we do butter] along with all the veg/fruit the garden produces year round. My great grandmother had a similar diet and lifestyle and lived well into her 90s. I'm shooting for that, too. Can you give me a link or two to read about this? It seems to me that even if eggs, etc have "good" cholstorol, there ought to be a consumption limit, depending on the amt. of energy you expend, and also on whether you also eat lots of vegetables and fruit. I tried some chickens in a chicken tractor here. It didn't work so well. Expensive chicks, lots of predators and very expensive feed really made it a lot cheaper to buy the meat and eggs from the store. Also, the few birds that I actually managed to raise to butchering size were as tough as old tires. I would have liked to try pastured poultry, but since there is nobody to close the coop at dusk, I'm afraid I would lose my birds the first night. Maybe when I retire I might think about getting birds again. Hello Anna, When I had chickens, we had Rhode Island Reds for eggs, and Cornish Cross for meat. The eggs were great, nice sized, with bright orange yolks that hardly flattened when put in a frying pan, and the cornish cross were good. We raised our meat chickens to a larger size than common- the ones you buy in the grocery store are typically six weeks old, and weigh 3-4 lbs. We butchered ours at 8-10 weeks, and they weighed 6 lbs. Usually, we would grill one whole, eat it for dinner. Then from the carcass, and saved feet, make soup. It was the most fantastic soup! For our family of 6, it was two well enjoyed meals, with plenty for all. If you read Carol Deppe's "The Resilient Gardener", she talks quite a bit about omega-3's and grass fed meat. Considering your level of physical activity, I would suspect that there is no reason for you to not eat the way you do, all the eggs you want, particularly when combined with all the veggies. On an unrelatd subject, we recently sold our house, and moved into a small, old trailer, on 30 acres, after 2 years of dithering. The downsize has been quite a challenge, although we are now a family of 4, as our two oldest have left home. We went straight to the sheet metal roof, and large porch, and also seperated our drains to utilize the grey water for trees we planted. I like the trailer for several reasons- it is old enough, and cheap enough that I don't feel bad "experimenting"- such as the greywater mods. It is also up off the ground, so I am able to get under, and change things as I get better ideas. We partially buried a shipping container to use as a storm shelter, before we put in the front porch, and now the porch covers it. That is also an experiment in ground coupled cooling- I am interested in what sort of temperatures I can maintain. I have really enjoyed your blog for the last couple of years- keep it up! -nutrition studies are not usually worth the paper they're printed on. They tend to be questionaire studies relying on the memory & honesty of the subjects, with no control over complicating factors. Who remembers how many ounces of beef they were eating each week, 25 yrs ago? -most studies only show a few percent difference in the groups- maybe significant statistically, but not practically. A recent study on meat consumption showed the "high" meat eaters had ~ 3% increased mortality over the "low" eaters. [Is that due to lifestyle differences in aggressive carnivores vs passive vegans?] They didn't report the rate of complcations of diabetes among the "low" meat (ie- "hi" carb) group. -in regards cholesterol, particularly: the financial incentives for frightening the public into thinking treating hi chol is important is obvious & has become a multi-billion dollar industry. In fact there is no evidence that lowering your chol reduces your risk of a 1st heart attack, and that even after a first MI, lowering it with meds only reduces the risk of a second MI by <3%. More than 3% of pts have side effects of using statins. Hi total chol is only weakly correlated with CV risk (r = 0.3. HDL level [basically determined by genetics, not diet] has r=0.5. Treating hi chol is superstition, not science. Hello! I've been a lurker of Walden Effect for quite awhile, and finally have something to chime in! We just started our covert suburban chickenkeeping experiment (bought 4 pullets and somehow ended up with a total of 14 'donated' from friends and neighbors). We had our first harvest of the roosters recently, and I was a bit on the fence about how much of a difference there would be in the meat quality. After stewing a 3 month old roo in my great grandma s chicken soup recipe (crock pot), I don't think I will ever buy chicken from the store again. The roo was a black and copper maran mix, and he was flavorful! Our flock wanders our 1/2 acre backyard all day, and they eat a fair amount of feed but I have been impressed with how much grass and bugs and weeds they consume as well. We are still waiting on our own eggs (as our donated layers needed doctoring and worming), but i cant wait to gloat over the quality. I think i would rather do without than consume commercial meat/eggs once we get going; for flavor as well as control over what we put in our bodies. I have not done a cost per pound analysis yet (I wanted to make sure this was something we wanted to continue before i started keeping data), but our freezer birds were all free, our coops have been built of free scrap wood and paint. It has become something of a neighborhood project as well, bringing in people who haven't really seen 'real' chickens before, and teaching neighborhood kids about how to care for farm animals. Even if all we ever got out of this experiment was our three eating birds and the experiences and 'togetherness' of the 'hood, I would consider it a success of priceless value. Mom --- It's a tricky topic because, as doc mentions in a later comment, it's very hard to do real scientific experiments on human nutrition. Here's an interesting summary of the purpose of cholesterol in our bodies and here's a summary of the Weston Price Foundation's dietary recommendations.